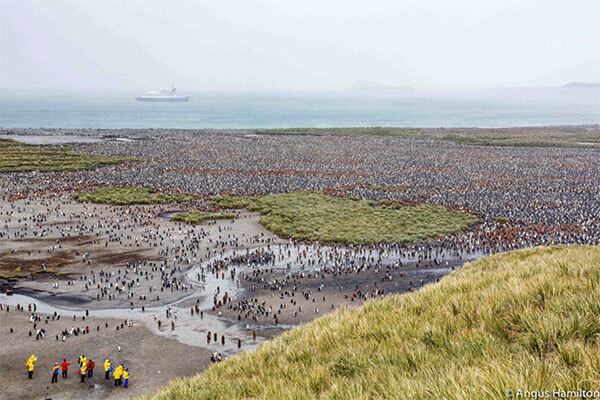 Have you ever wondered what life is like aboard a Quark Expeditions ship and during polar excursions, beyond what you see and read online and in the travel brochures? Polar-passionate traveler and Quark team member Dave Riordan visited our Quark office in Toronto recently and sat down to answer the questions prospective travelers ask us most often. Our booking staff are polar experts in their own right, coming from a variety of polar travel backgrounds and each having participated in a Quark expedition. However, Dave brings to the table a breadth and depth of experience, having traveled with Quark for ten seasons in a variety of roles including Expedition Leader, program coordinator and now Logistics Manager. 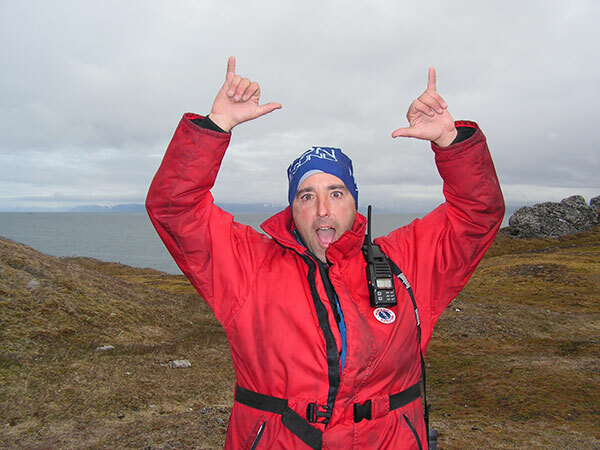 All told, he spends about eight months of the year on Quark Expeditions ships. In his off-time, Dave is addicted to travel, as well, spending just a couple of months a year "at home" in Courtland, New York. 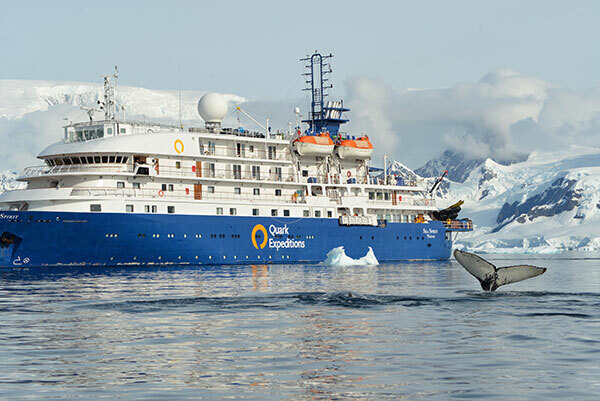 This upcoming Antarctic season, you'll find Dave cruising with Quark passengers on the Sea Spirit and Sea Adventurer. 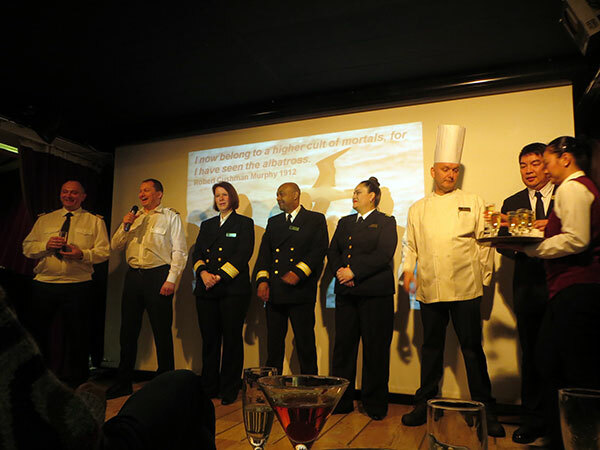 On board each Quark Expeditions ship, Dave explained, there are three groups of people: Quark travelers, Quark expedition staff, and the ship crew – engineers, deck officers, the receptionist, bartenders, wait staff, housekeepers, etc. "The ship crew are from all over the world and typically, there are about 60 of them on board," he said. "There may be 12 to 15 Quark team members and I'll tell you, the better we all get to know one another, the better the ship runs. They're a fantastic group and we'll often go join them below deck in their common quarters, like the break room and cafeteria, and get to know them." Quark Expeditions team members stay in the same types of quarters, in the same area of the ship, as travelers. "We take meals together, do shore excursions together, and spend time together on the decks and in the restaurant/bar areas," Dave said. "Passengers don't expect the comfort level when they get on board and there's something so special in getting together throughout the trip with these people who all want to have that same awesome polar experience. It's a worldly, amazing group of people; we're there day and night to answer questions and share in the experience with them." Dave also noted that people are often surprised at the services available on board. "Technology has changed everything – people are surprised that there's any internet service at the poles, but we have satellite." He explained that the Internet connection is usually good enough for sending text-only messages, for checking email or sending short tweets to Twitter. "But then, some are surprised it's slow and intermittent," he chuckled. "For the most part, passengers are impressed we can communicate with the outside world at all when we're in the most remote regions on earth." The in-room TVs don't have any outside programming and are used to show in-house movies and display daily information, he explained, adding, "We get very little news from the outside world. It can be a really good thing but you can have serious culture shock." On returning to port, Dave said, "The first time you see a tree… it's crazy! I like to go straight to a mall just to freak myself out." People's expectations are always different, he said, so being prepared before you go is important. "Usually, the team gets up bright and early and has a pre-breakfast meeting," Dave explained. "We have breakfast with guests and then get into our gear and head out for the day. That's when we launch the zodiacs and check out the landing sites before we take the guests out." This is especially important in the Arctic, he said, where they need to make sure there are no polar bears or other carnivorous animals onshore. The team then marks out the perimeter of a path for passengers to use onshore. "We're taking about 10-12 passengers out in the Zodiacs and will bring them ashore for the morning," he said. No food is allowed to be brought on shore in the Antarctic, he cautions, so shore lunches are out of the question. The North Pole is an exception, he noted. 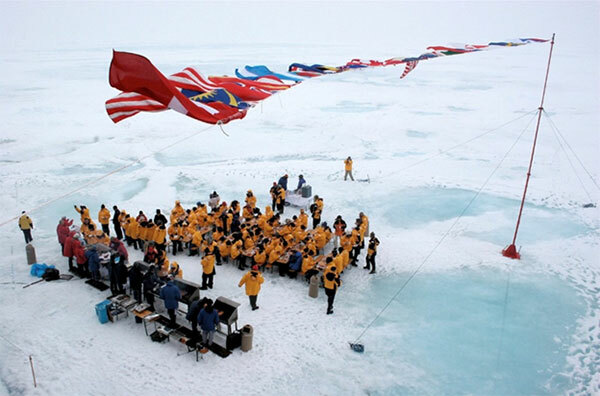 "We bring tables and chairs and a BBQ and you're floating on ice 4000 feet above the sea floor, in June or July. It's incredible and I can tell you, the passengers who get to participate in that will never, ever forget it." "If the weather is bad and everyone stays on board, we do lectures with our marine biologists, ornithologists, or other experts. They'll give presentations and we may have parties, or a scavenger hunt, or even quiz nights. We're all entertainers at heart!" Dave said of himself and his teammates. "After the morning excursion or activity, we go straight into lunch and then gear up. The ship will be repositioned to another spot." Afternoon excursions are often when optional adventure activities take place, Dave said, such as kayaking, stand-up paddleboarding, hiking or cross-country skiing. "Each night, we have recaps of what we've seen throughout the day. We put slides together from our cameras and put together these presentations on the fly." Most people are using PowerPoint, he said, and one person collects everything and puts it together in one presentation for the recap. "We go from person to person and share what we saw that day." Dinner is a delicious but casual affair, he said. "People can sit with whomever they choose and mix and mingle. A lot of the passengers are well traveled, so you'll hear these great conversations about polar travel, but also about travel the world over." After dinner, passengers are free to take part in the every-other nightly activities in the lounge, settle in to watch an educational movie, or head to their cabin. "Depending on each person's sleep patterns, some are real morning people and others are more night owls. I prefer to stay up in the lounge chatting in the evening than to be up first thing in the morning," Dave said. "We have experienced, trained guides for every activity, whether it's mountaineering or hiking, or one of our watersports," he said. 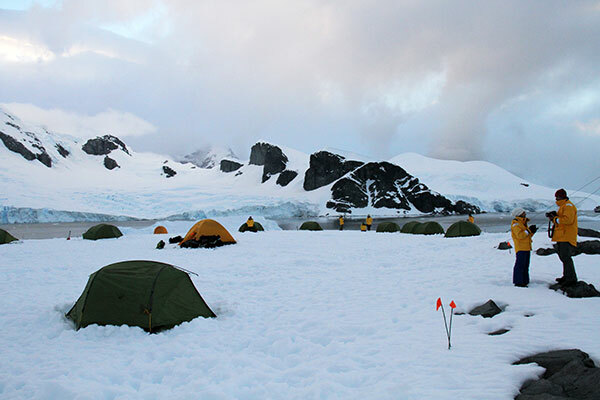 Dave was a camping guide for six years before joining Quark and he usually runs the Antarctic camping program on his excursions. "We take about 30 people out after dinner and come back before breakfast, as they're not allowed to eat while they're out there," he explained. It's light all night during the summer in Antarctica and they usually don't need headlamps. "It's incredible… we listen to the penguins and the whales blowing and the ice cracking. I'm usually tucked in a bivvy bag – a waterproof shell, with just my head sticking out," he laughed. Photo courtesy of Paul Shaver from of our passenger slideshow, Antarctic Explorer voyage, Feb 2014. 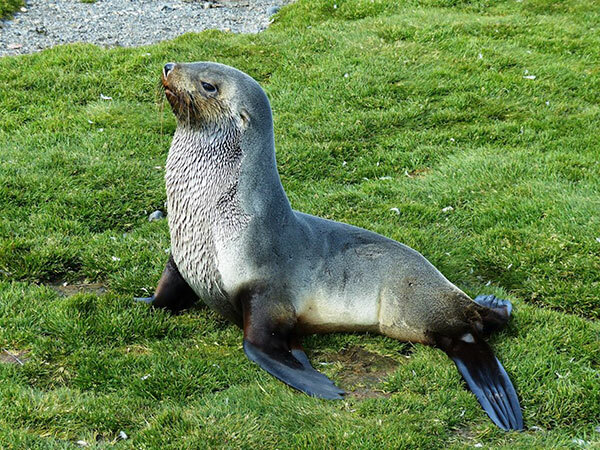 Dave warns that campers have to watch for the Antarctic fur seal (seen above): "It looks like a dog wearing mitts and they bite! They may come into the campsite. We camp on top of the snow so animals don't jump into a snow pit with us. They're about the size of a German shepherd," he said. 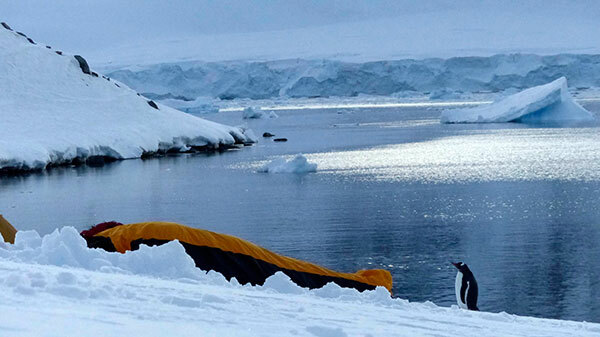 It happens, too – Dave told us a story about a camper digging deep into the snow in an effort to get further out of the wind, only to have a fur seal hop down into their pit and refuse to leave. Other animal sightings are common for campers. "A penguin might come look at you while you're sleeping… I once woke up to a penguin jumping on my chest and then calmly just walking away!" You never know what to expect on the seventh continent, he said. "We once had a penguin and a Weddell seal guard the toilet all night," he laughed. "Sure, it was a bit creepy at first. We try to set the toilets up behind some kind of snow wall or natural sight barrier and here were these two little guys, just hanging out right there for the entire night. Just keeping an eye on things, I guess!" Oh, and about those Antarctic toilets… "Everyone gets a very realistic briefing of what they'll experience before they go camping. Sometimes people decide it's more than what they want to get into, and that's totally fine!" Dave said. "We have bucket toilets and everything goes back onto the ship for disposal in the proper sewage system. We make sure people understand how everything is going to work out there so there are few surprises." Once passengers go to shore, he said, unless they're hypothermic or there's a medical emergency, they're can't return to the ship. "We take safety very seriously at Quark and have emergency equipment with us in a tent, with wilderness first aid leaders in camp. We do take flares, blankets, signalling equipment, food rations, and water, just in case. We want everyone to be comfortable and happy and a big part of that is knowing what to expect while you're out there!" he said. Even with all of that preparation, Dave said, "people are often surprised and even in awe at the sheer scale of Antarctica and the Arctic. You can learn about the animals and the geography, but you can't understand it until you're there. It's massive." Travelling different areas of the world, he explained, you have all of these different cultural elements – the history, the languages, the people, the traditions, and so on. "But in the polar regions, you have no inhabitation. There are no trees – it's just epic nature and you don't have to tune out the human aspect of it. It's amazing how that floating vessel turns into a community for the time you're together," he said. For Dave Riordan, heading out to the ships is like coming home. It's a sentiment shared among many experienced polar travelers. Whether it's your first expedition or your twenty-first, a typical day in the polar regions is highly unlikely to be typical in any way, shape or form. And we wouldn't have it any other way!